Live From InTheBlack 2018: Designing Software. Building Trust. In 2017, Deloitte’s finance organization decided that in the face of expanding technological innovation, they needed to step up to the plate. The business had been using Finance on an ad hoc basis, and they refused to be overrun by the digital era. Finance decided to act—not react—and develop a common vision. Through research and analysis, they found that shifting to digital enables the sale of high margin products and services, fueling the wave of the future. Here are some of Deloitte’s predictions for the future of Finance. Applications and microservices will challenge traditional ERPs. Finance will need to be supported by cloud applications like BlackLine. Deloitte suggests that to prepare for the future, organizations should reform their processes from the inside out, starting with intercompany reconciliations. The process they propose has three main guidelines, although they did admit it’s not going to be so simple. For Deloitte, tax reform brought intercompany to the forefront, as they needed visibility at the transaction level. As a business with over 120 legal entities, in 35 countries, across 5 ERPs, Deloitte’s tax exposure is estimated at over $700 million. And they trust BlackLine to help. Genpact’s Vivek Saxena and Mondelēz’s Victoria Hernandez took the stage at InTheBlack to discuss how finance leaders can move toward an on-demand close. The two companies have worked together for a while now, and Mondelēz moved over to Genpact to help with their data. In the ensuing transformation projects, Mondelēz implemented BlackLine for their reconciliation process. Utilizing BlackLine is enabling their teams to plan for the future and focus on how they can accomplish goals that seemed out of reach before. Mondelēz has seen marked improvement in their close cycles. When you have to release the numbers, you want to understand that data and any variance that’s occurred. Most of the discussion is linked to what has happened externally with the company. There’s so much external and unstructured data available that finance teams need to understand and incorporate into their insights. When there was limited access to data it was easy to solve the puzzle, but now with more data available, the puzzle has gotten more difficult and complex to work through. That excess of data is affecting companies of all sizes. Even smaller and mid-size businesses have access to a wide range of data, so it becomes a question of where to find the competitive edge. Vivek believes that the companies who are able to reduce the life cycle of taking in data to produce insights are the ones who will come out on top. So how do you get the data to function on a day-to-day basis so those insights are available as quickly as possible? By shifting toward a new close paradigm. The sequential process should shift so that the journey from data to insights becomes much shorter. 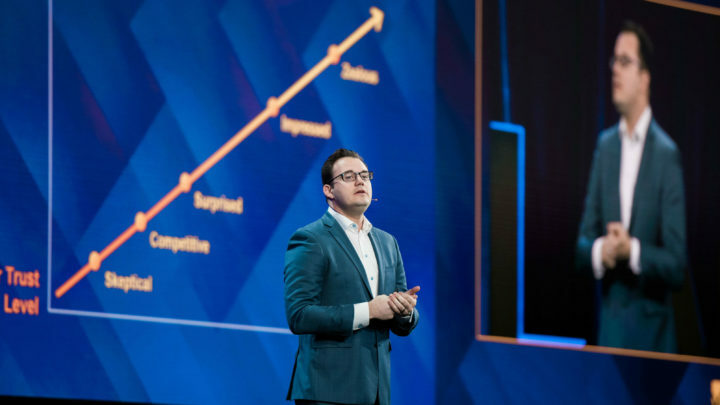 A continuous close will transform accountants into value creators, and an on-demand close can improve that value even further. It can be hard to move to a continuous close immediately, but making strides toward it is how things get done. By the time you’re ready, you can take advantage of the changes in technology. Some of those changes will involve machine learning, AI, and robotics. This technology can help accountants manage an automated close where things happen on a day-to-day basis. More computing power will help process all of the information and the data that is available in today’s world. You don’t want to just make a bad process faster. With that kind of power, it should be a reason to look and adjust the processes to make everything stronger. Policies and procedures should reflect where you want to end up. Internal controls can benefit teams by generating reports and offering possibilities for the future. By understanding what changes may result in what outcomes, it becomes easier to see where improvements can be made. And it’s essential to ensure that each improvement will help you reach your vision. Machine learning, RPA, and AI are getting a lot of attention. And instead of accounting being last to get their hands on revolutionary advancements, we’re bringing new functionality to enable your organization to build a more intelligent, more automated, and more trusted accounting function. 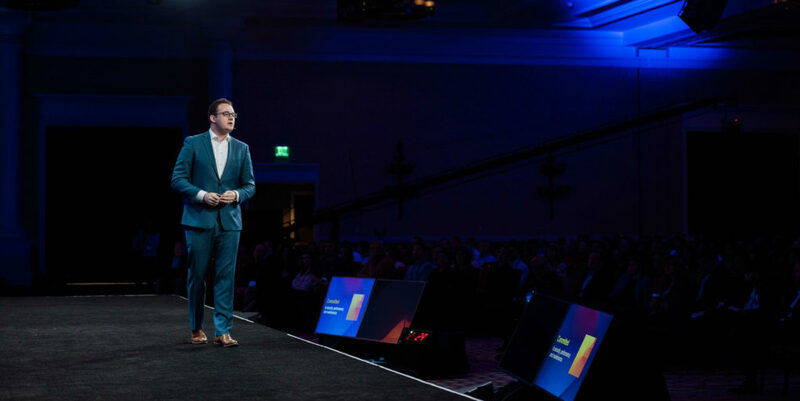 This morning at InTheBlack, Product Director for Compliance Brandon Seip unveiled the newest addition to our finance automation cloud platform: BlackLine Compliance. The solution focuses on streamlining internal control management for both the compliance and internal audit teams. Compliance builds trust by extending the BlackLine Unified Cloud Platform into the second and third levels— increasing the organization’s confidence in their control framework. We already have an SAP Connector, and today we’re rolling out an Oracle Connector to better serve our customers who are running Oracle. 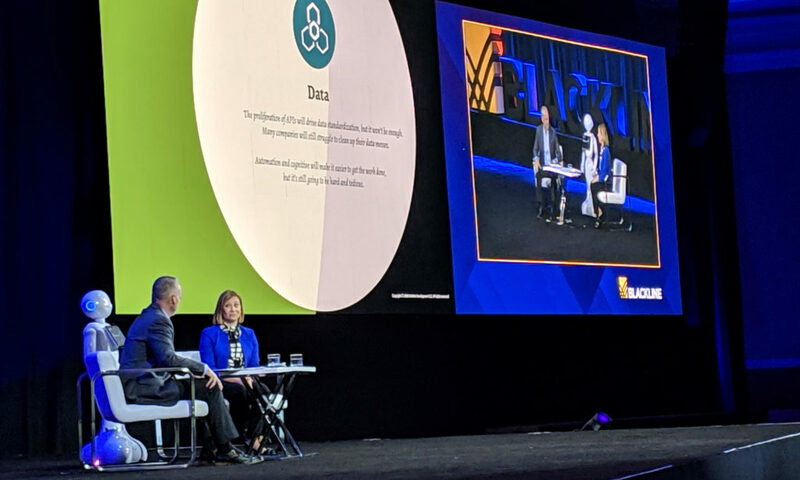 In the coming year, we want to hear about every source of data our customers want connected, so we can talk about how to make that happen. Please reach out to your Customer Success Manager to contribute to this conversation. Director of Machine Learning Sapna Nagaraj leads the Data Science R&D at BlackLine. Their mission is to find ways for artificial intelligence—machine learning (ML) in particular—to complement BlackLine’s products and services. 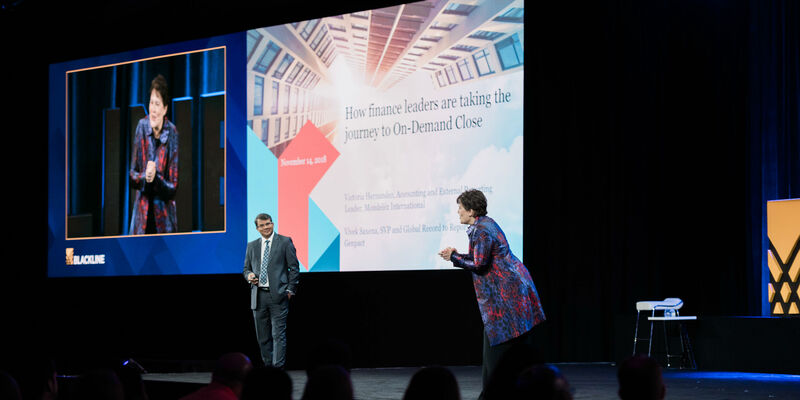 BlackLine is committed to help your organization get ready for the future of Finance by putting the latest technology and innovation at your fingertips. True AI is still fiction, but what does exist is a specialized form of AI known as narrow AI. This is made possible by machine learning, which is a technique behind narrow AI. And machine learning can do some of the most tedious tasks in minutes. You may be wondering how you can trust a machine to do the things you do just as accurately. The answer? Because the machine learned from a great teacher: you. Humans guide the learning process for the machines. It takes an average of 2 minutes to create a manual match. If you have 10,000 matches to make, you may have to hire someone for an entire month just to complete these matches. But if a machine can analyze the features of two items and determine whether or not they’re the same, it can easily be predicted whether or not they match. During our internal testing, our engine has been able to predict the correct match 98 times out of every 100 transactions. We hope you’re as excited as we are about what machine learning can bring to finance and accounting. We’re bringing cutting edge technology to you as simple, easy-to-use software. Let’s embrace the inertia and in doing so, also embrace innovation. Humans are bad at software—it’s unlike anything our brains have encountered before. At a visceral level, we can’t conceptualize why software works because it’s invisible. But, it’s unbelievably powerful. During this process, people often develop an unhealthy relationship with their technology. We’re disappointed when it doesn’t work, and we feel as if the software itself has let us down. However, throughout the stages of building trust in software, the one constant is the software itself. Good software is fast, simple (in that it does relatively simple math), specialized, and predictable. Still—especially in Accounting and Finance—professional standing is predicated by how much people are trusted. So, it can be a risk to suggest the adoption of new software in the workplace. That’s why BlackLine is committed to promoting transparency with our customers. It’s not usually in a software company’s best interest to promote total transparency, because the “magic” of software is part of what makes it desirable. But we at BlackLine would rather you trust us to help transform your financial processes than to obscure the magic through smoke and mirrors. We want you to know how our solutions are designed and built, not just “how it works”—though, we do want you to know that too. 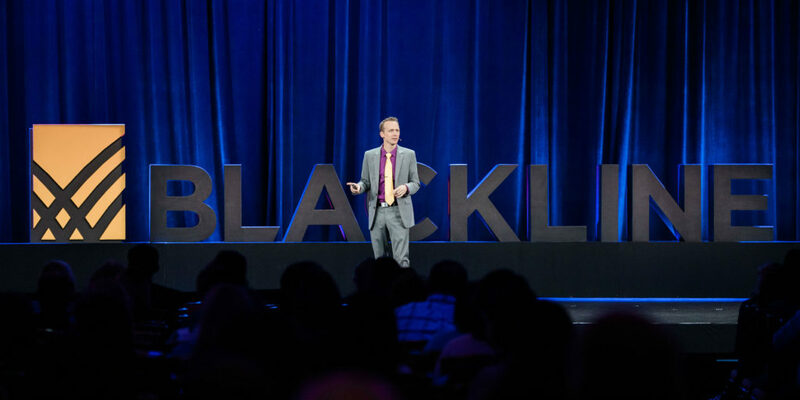 BlackLine aims to help reduce the human tendency to develop unhealthy relationships with software by making sure customers always have access to a human they can trust when they have questions or concerns. Be sure to stop by the Sandbox while you’re at InTheBlack. Members of the BlackLine Product Team are eager to connect with you and answer all your software questions.